What’s a social media content calendar? Only the most helpful tool you could ever add to your social media marketing toolkit. Picture this: you own an artisanal donut shop and it’s #NationalDonutDay. You had no idea until a customer asked, “Hey, are you guys doing anything for National Donut Day?” Now you look like an idiot. But it’s not your fault. You were just busy running a successful business. Enter the social media content calendar. It’s exactly what it sounds like: a tool to help you plan and schedule all your social content in advance. Just like a regular content calendar, you’ll decide what and when to publish—but with the added specificity of social platforms. Most importantly, you’ll never miss #NationalDonutDay again. 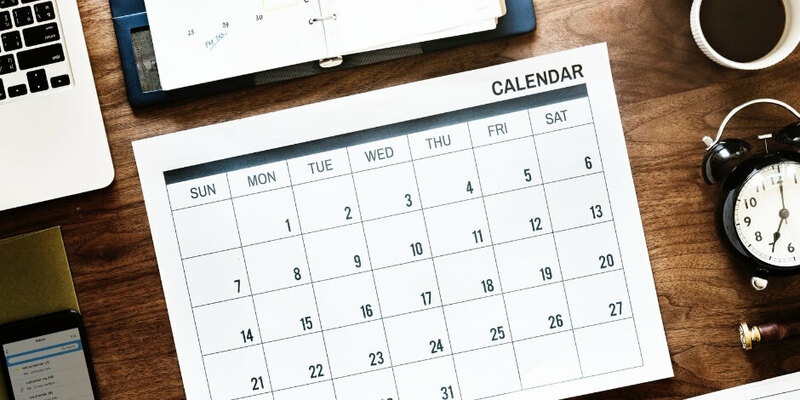 Read on to find out everything you need to know about social media content calendars. According to the Content Marketing Institute, 92 percent of content marketers use social media to distribute their content. But as Buzzsumo reports, content saturation is making it harder than ever for marketers to stand out in their customers’ feeds. As organic reach continues to decline, the days of lazy, disorganized social media posting are behind us—no matter how great your content is. Is it important to your brand that you celebrate #NationalDogDay? What about #StarWarsDay? #NationalPizzaDay? A social media content calendar can help you stay ahead of all these social media holidays (along with “real” holidays like Thanksgiving and New Year’s Day). You won’t miss any opportunities to elevate your brand and engage with followers on special dates. For example, in March 2018, we celebrated #NationalPuppyDay by sharing a video from the perspective of one of our office dogs. The video highlighted Hootsuite’s dog-friendly office culture, giving customers a glimpse behind-the-scenes—and an opportunity to look at a bunch of cute dogs. But, it took some advanced planning to pull off. Posting consistently is one of the best ways to get more Instagram followers—but that’s true for all the other social platforms as well. No one will want to follow you if the most recent post on your profile is from two years ago. A consistent posting schedule shows potential followers you are invested in the channel—meaning a follow will be worth their time. Better yet, consistent posting trains your current followers to expect and engage with your content on a regular basis, cultivating long-lasting relationships that lead to sales. A social media content calendar will help you post consistently across all platforms by ensuring that content is planned and scheduled in advance. No more forgetting about your Twitter account for weeks only to publish 25 tweets in one day while playing catch up. No one loves friends who only talk about themselves. The same goes for brands on social. If you only post when you have a sale on, or a new product to offer, you’re not reading the room. And you’re BORING! Another ratio is the 80/20 rule: 80 percent helpful and interesting content for every 20 percent of content that’s selling your product. Planning your social content in advance ensures you are publishing a balanced amount of content from each category. Bonus: you won’t end up alienating customers with too many self-promotional messages. A social media content calendar shared on a cloud platform like Google Sheets or Dropbox is a collaboration power tool. Whether you’re sharing information with stakeholders or updating your team, this calendar serves as the single source of truth for what’s being published and when. A common, shareable calendar also makes it easy to divide planning duties among team members. If someone’s out sick for the week, no one is left wondering what to post. “But isn’t maintaining a detailed calendar of every social media post going to cause me more work?” you may be wondering. Honestly, the answer is no. Using a social media calendar is going to save you time. If you have a plan for your future social content, you can schedule your posts in advance (with a tool like Hootsuite). Then, you won’t constantly be watching the clock. You may even be able to take a vacation. You know what they say: by failing to prepare, you’re preparing to fail. A great social media post often involves copywriters, designers, and even video editors. It’s a collaborative effort, and quality work takes time. A few brilliant creatives get their best work done at the very last minute, but generally the opposite is true. Planning ahead puts less strain on you and your team members, as well as company resources. And you’re more likely to publish your best quality work. Last-minute posts also tend to have a ripple effect throughout the organization. If you’re pulling people in to work on something without any notice, other teams’ schedules and projects are impacted too—and it’s often a struggle to get everyone back on track. One of the cardinal sins of social media management is posting the exact same message on multiple networks. It’s happened to all of us—asking your Facebook followers to “retweet” you or tagging a brand on Twitter who only has Instagram—but it’s less likely to happen if you plan ahead. A social media content calendar lets you write out unique captions for each social platform in advance. Then when it comes time to schedule your posts, it’s just a matter of copy-and-pasting the right caption to the right network. Bonus: you’ll avoid looking foolish and disorganized to your followers. A social media content calendar is not just a planning tool—it’s a record of everything you’ve ever published. It’ll be the first to let you know if you’re overusing the word “legitimately,” or if you’ve shared that cute dog video too many times in the last week. While planning new content, look back to make sure you’re not repeating yourself. Having a record of what you’ve published makes it easier to measure results. Plus, all the time you’re saving not scrambling to publish last minute posts can now be used to optimize performance. Compare your publishing schedule to your analytics and see if you can find any patterns. Perhaps posts published on Thursdays perform the best. Maybe your Facebook followers are really into 15-second videos, while your Twitter followers prefer long-from blog posts. Maybe your Instagram followers like to see one post a day, while your Linkedin followers like four. Take your findings and continue to test and optimize until you find the perfect publishing schedule that works for your brand. Bonus: If a post does consistently well, it may be a good idea to “boost” it with some advertising dollars, so even more people get to see it. Before you can create a social media planning calendar, you need to take stock of your current social media efforts. What platforms are you using? Which ones are performing the best? Should you continue publishing to all of them? Or are there any that can be deprecated? Are there any imposter accounts that need to be shut down? What are all the usernames and passwords of each account? How many times per day are you currently posting to each network? What are the goals for each network? Who is responsible for each channel? This is all useful information to include in your social media calendar, especially if you work on a team. Is any of the content you plan to post out-of-date? If so, can it be updated? Or should it be scrapped? Also, what types of content have performed well in the past? And what sorts of things are your competitors posting? These are all important questions to ask yourself while planning your future social media publishing schedule. Each social network speaks to a distinct audience, and these audiences shape the content you will be expected to share. You may have customers who follow you on more than one network, but, for example, your Facebook audience may be older than your Snapchat audience. They may not understand your Zendaya GIFs. Posting content that is tailored to each platform and its unique audience is an important part of any social media marketing strategy. Get a handle on these distinct demographics before you start inputting content into your social media content calendar to ensure everything you plan to post is appropriate. If you’ve already done a social media audit, you’ll have a handle on how often you’re currently posting to each social network. Will that be the plan going forward? Or are you going to change things up? Either way, your posting frequency will determine the shape of your social media planning calendar—a.k.a. how many slots you need to leave open per network. So it’s best to make a decision now, even if you find you need to tweak it later. Your social media calendar should have some sort of content categorization system. This will help you track what kind of content your followers seem to enjoy the most. One suggestion is to label your content self-promotional, curated, or user-generated. Or maybe you want to note the type of content, such as: blog post, video, or announcement. Ultimately how you label your content is up to you. But whatever you decide, make sure the labels are descriptive and actually helpful (although that may take some time to determine). Also, decide how much of each type of content you want to post, so that your calendar is aligned (see “Find your ideal content mix” above). A content repository is just what it sounds like—a place to store all the pieces of content you may want to choose from when building your social media planning calendar. It can be as simple as a spreadsheet (or a tab on your calendar spreadsheet), or an entire database. You could also include space for interesting excerpts from the piece of content. These may help to inform the final copy of your posts. What level of detail does your calendar require? Do you need a separate spreadsheet for each network? Or can all of them fit on one? Do you need to be able to assign people tasks? Or note when something has been posted? Or have it approved by anyone? Now for the fun part: filling up your calendar with awesome content! But don’t just go at it willy-nilly. Make sure you’ve got a process in place first. Decide who is responsible for updating the calendar. Will the same person also be responsible for scheduling and publishing the posts? Will you need to assign copy to a copywriter? Is someone else responsible for sourcing images? And do the posts need to be approved by someone before going live? How far in advance will you schedule content? Speaking of which, what’s the process for coming up with new content? Is there a brainstorm involved? These are just some of the questions your team will need to answer before you start inputting content in your calendar, to ensure maximum organization and flow. Even if it’s a lean process, and you’re a social team of one, sticking to a process will help minimize mistakes. Depending on your organization’s size, there may be value in sharing your social media calendar with a few other teams with whom you share common goals or KPIs, or who would simply benefit from knowing what you’re up to. These may include (but aren’t limited to): content writers, blog managers, video producers, designers, campaign managers, project managers, and clients. Make sure to set appropriate permissions for each member you invite. Not everyone needs editing access, for instance. And remember: there is such a thing as too many cooks in the kitchen. Evaluate all requests for access carefully. Wow. You’ve made it. This is the step that’s going to save you oodles of time, money, and brainpower. It’s time to schedule all the content you’ve painstakingly planned and created for publishing so you don’t have to press “SEND” 25 times a day. When it comes to long-term editorial planning, few organizations are more advanced than magazines. Because of their regular cadence, publishing restrictions, and reliance on annual features or seasonal topics, most major magazines plan themes—and even specific content—for an entire year in advance. While the content you’re planning will likely be a tad different than the average magazine, seeing how this is done can be incredibly helpful—especially to inspire some of your own social media calendar ideas. Luckily, many magazine editorial calendars can be found online. The following examples are a few of the best. 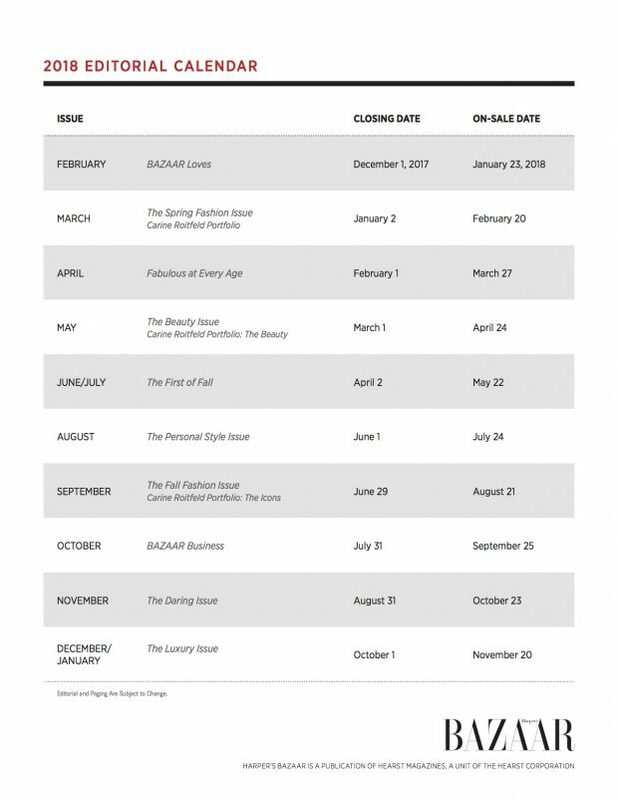 This editorial calendar from fashion magazine Harper’s Bazaar is a good example of what a simple overview calendar could look like. This style would probably be best for mapping out key themes or events each month without much detail on how those concepts will be approached. It would be good to share with stakeholders who are higher up in your organization who may need to approve or provide input on the general direction of publishing, but who don’t need to know the details. 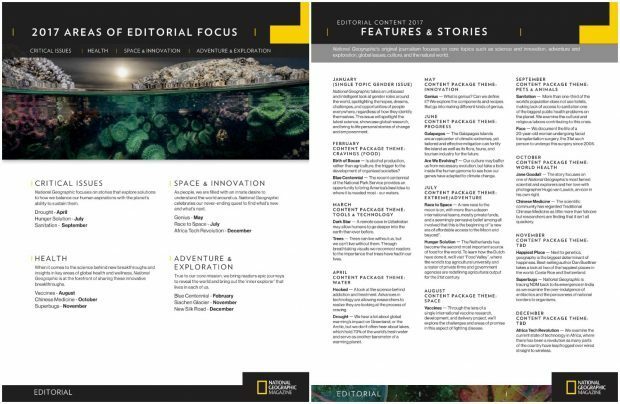 While National Geographic has a standard editorial calendar—which includes details on key articles for each month’s issue—what sets their planning apart is the “Areas of Editorial Focus” document. This part of their editorial calendar maps out four key themes the magazine plans to tackle over the course of the year, which issues they’ll talk about them in, and how they’ll approach each. It’s an excellent example of high-level thematic planning and how it works together with a more traditional editorial calendar to create a comprehensive overview of upcoming content. The first page of this lifestyle magazine’s editorial calendar is another high-level overview. It indicates the theme of each print issue, as well as important publishing dates. Condé Nast Traveller is a visually-focused publication, so it makes sense that they’ve also included images to express each theme. These can act as quick reference points for stakeholders looking to contribute. The second page outlines three major themes for each month of digital publishing, and also includes mood-evoking photos. 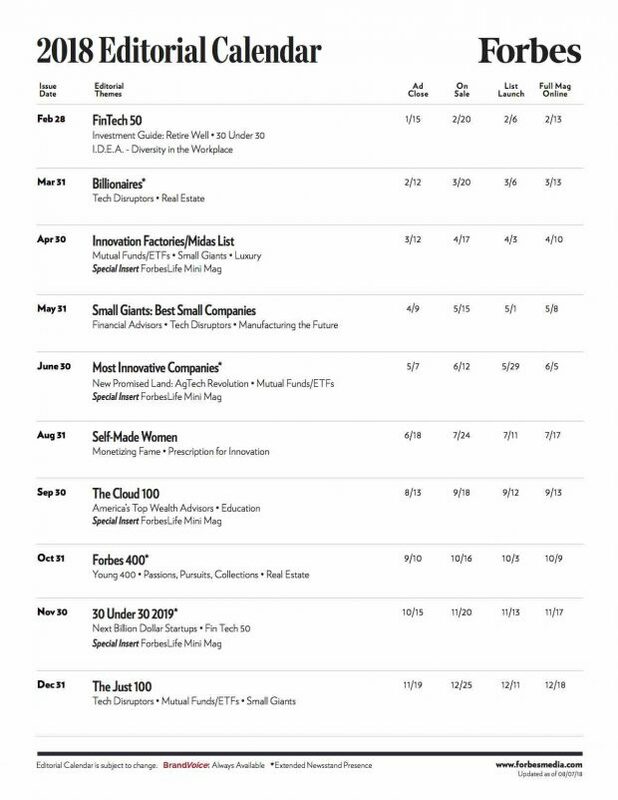 Writers, photographers, advertisers and other creatives can look at this calendar in order to craft appropriately targeted pitches. 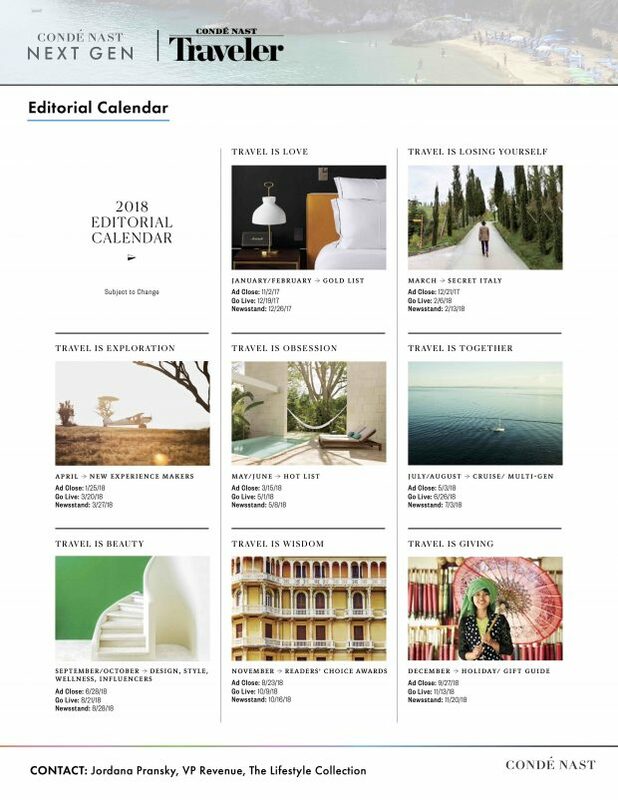 Business magazine Entrepreneur’s editorial calendar may not be as beautiful as Conde Nast Traveler’s, but what it lacks in creativity it makes up for with information. 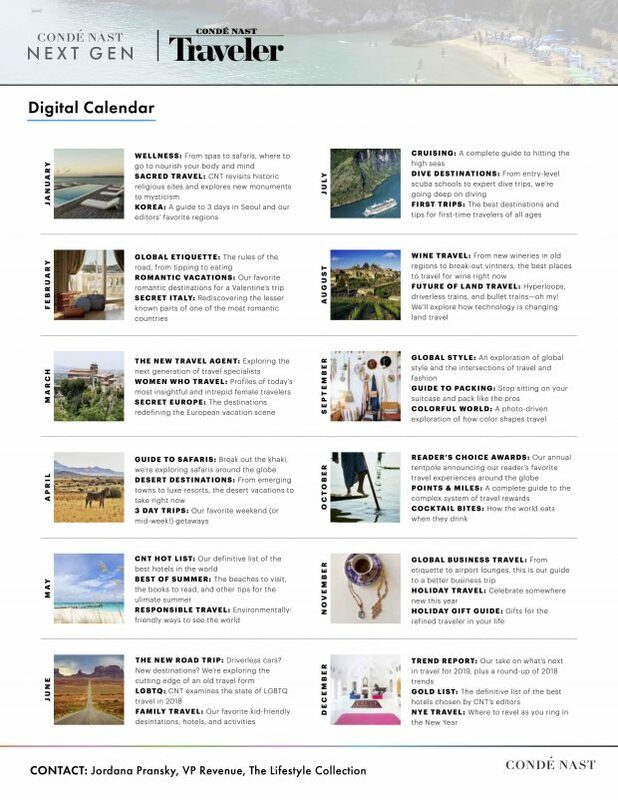 This calendar not only maps out broad themes for upcoming issues, but also lists specific pieces of content that will appear in each edition as well as related digital assets. It’s a clean, minimal, and functional approach to an editorial calendar. 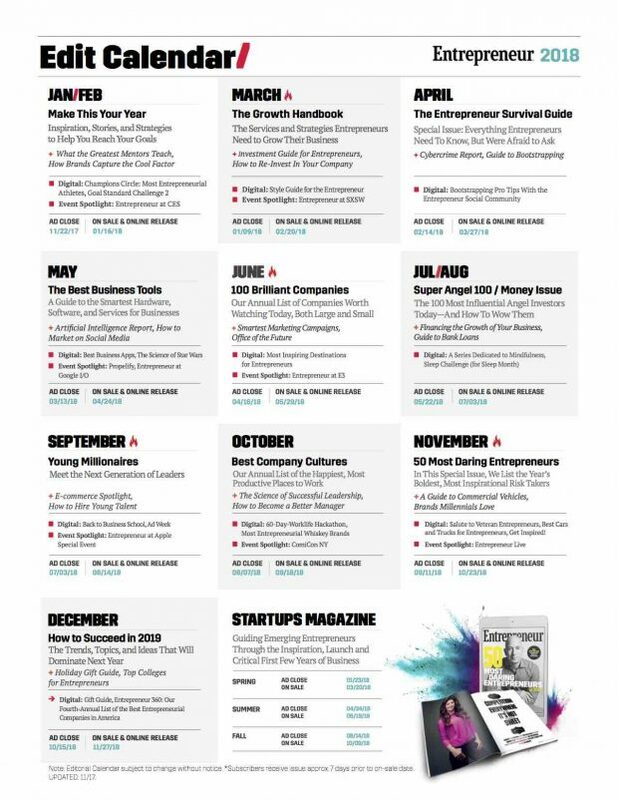 Likewise, business magazine Forbes’ editorial calendar maps out the overall theme for each issue and what key pieces of content will be included in each. Their digital content calendar goes into more detail, outlining content “programs” scheduled for web publishing. A star is used to mark programs that are expected to change. While many of these editorial calendars are aesthetically appealing, we recommend focusing on function over artfulness in your own social media calendar. Having a calendar that’s easy to edit and update as changes are made is key. If you prefer doing this in a format that’s also beautiful—perhaps to get buy-in from higher-ups—that’s cool too, but not imperative. We’ve done the hard work for you and created both editorial calendar and social media content calendar templates that you can use for your business. Simply open the link to the Google Sheets file for each, make a copy, and plan away. Below, find instructions on how to use these templates. This template is intended for planning individual content assets, such as blog posts. It includes sections to fill in for the title of each item, the author, the topic area it covers, and the deadline, as well as the anticipated publication date and time. Simply create a new tab for each month and fill in your content accordingly. The content from each week of the month is divided by colored bars for clear visual separation. This template is intended to be the single source of truth for all of your social media publishing activities. Like the editorial calendar, it’s divided by week with different months separated into tabs. Each week is further divided by network. The big four social networks have been included here for simplicity’s sake, but If you use any channels not listed here, you can easily swap them out or add space for them. A basic Google Sheet provides everything most social teams would ever need to create a functioning social media calendar. It’s easy to use—and most importantly, easy to share. 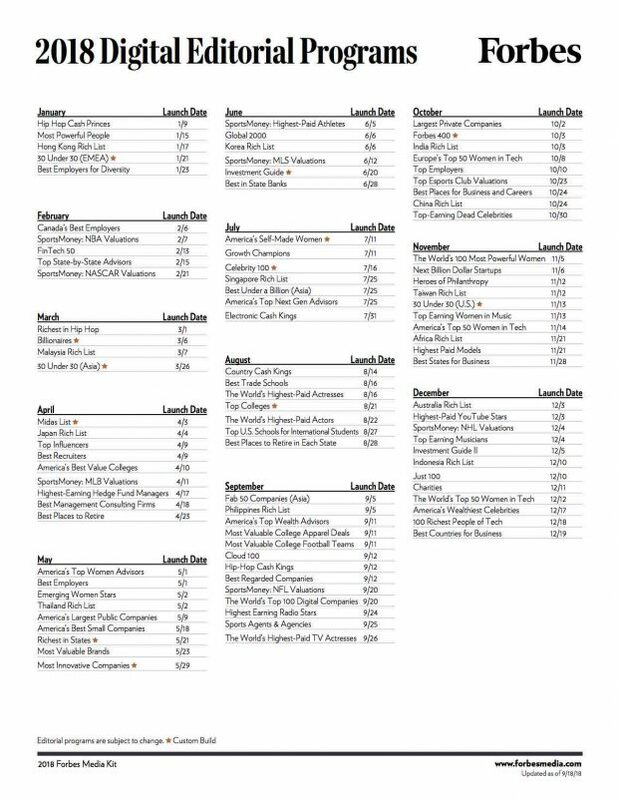 Plus, it’s what we used to create our Free Social Media Content Calendar Template. So if you’re planning to use that, Google Drive is your tool. If you’re a Hootsuite user, you can conveniently manage and view all your scheduled social media posts in Planner, a visual calendar available in the Hootsuite dashboard. You can also create brand new posts in Planner. Depending on your social media planning needs, Planner might supplement your Google Sheets calendar, or serve as your sole social media content calendar. Evernote is a note-taking app that also offers customizable planning and calendar templates. These daily, weekly, monthly, and yearly templates can be used to keep track of your social publishing in various degrees of detail. Trello is a favourite app among project managers and collaborative teams for its flexibility and easy-to-use interface. Use “cards,” customizable “boards,” and “lists” to manage not only your social media calendar, but your production process from start to finish. You can even contain brainstorm ideas in this app. Once you’ve planned your content calendar, use Hootsuite to schedule all of your social media posts, engage with your followers, and track the success of your efforts. Try it free today. With files from Kendall Walters.